I have an addiction. I’ve spoke on that before. By now, it should be no news to you, that I love pumpkin. The thing is, people know this and feed my addiction. Lindsay of Love and Olive Oil fed me some of her pumpkin recipes. One of which was this cookie recipe. I couldn’t resist making them. I changed the recipe up just a tad, as the original called for only chocolate chips, and I had some butterscotch chips I’d been itching to use. These cookies had a great texture. Sometimes pumpkin baked goods can be too puffy and muffin like. These retained a great cookie chewiness. I baked them in two batches. One, after letting the dough rest for about an hour or two (the ones you see in the pictures), and a second batch I baked after letting the dough rest for about 3 days in the fridge. As with my favorite cookie dough recipe, the ones that rested longer tasted and looked better. The flour/dry ingredients better absorbed the wet ingredients with a longer rest. I’m really glad I used both butterscotch and chocolate chips, as they really balanced each other out and complimented the cookie very well. As I’ve mentioned before, The Boy is not the biggest pumpkin fan. But he was a big fan of these cookies! I’d come home from work and find the cookie stack quite smaller than when I’d left. 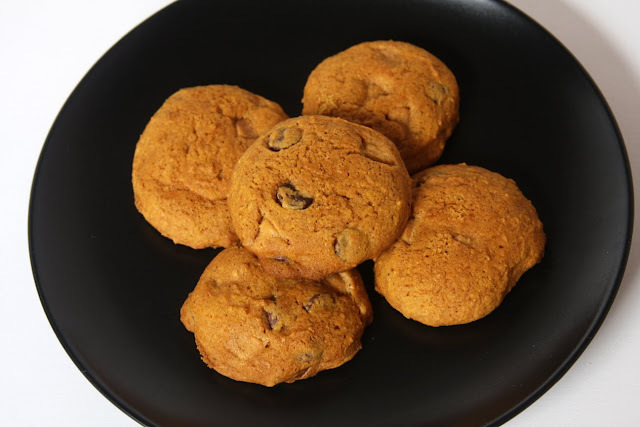 If you’re looking for a fresh, delightful cookie recipe to showcase some canned pumpkin you’ve been lucky enough to procure, then look no further. 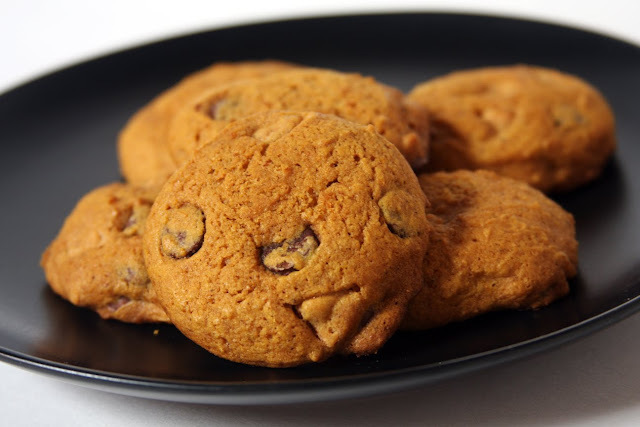 These would be great served up at a Halloween party, with their orange color and the dark brown chocolate chips; especially served up on a black plate like this! Using a mixer, beat the butter until smooth. Beat in the white and brown sugars, a little at a time, until the mixture is light and fluffy. Beat in the eggs 1 at a time, then mix in the vanilla and pumpkin puree. In a large bowl, whisk together the flour, baking soda, salt, cinnamon, ginger, nutmeg, and cloves. Slowly beat the flour mixture into the batter in thirds. Stir in the chips. (Optional: This is when I would recommend pressing plastic wrap onto the dough and refrigerating for at least 1 hour and up to a couple days.) Scoop the cookie dough by heaping tablespoons onto the prepared cookie sheets and bake for 15 to 20 minutes, or until the cookies are browned around the edges. Remove the cookie sheets from the oven and let them rest for 2 minutes. Take the cookies off with a spatula and cool them on wire racks. Love the addition of butterscotch chips, too! Love the addition of the butterscotch. These would also be good with some dried cranberries or something (you know, if you're in to that sort of thing). I usually make them with whole wheat flour (can't even tell the difference!) and then I can practically justify eating them for breakfast. 🙂 Now that I've manged to find canned pumpkin, I'll be making a batch (or two) this weekend! So weird that you just posted this… Mom had a customer at the post office make them some Pumpkin Chocolate Chip cookies yesterday, but she didn't leave the recipe and mom was dying for me to make some more… I promised I would look it up and then you posted this on your blog… I bet the butterscotch really blends the chocolate to the pumpkin…… they look SOOO yummy! YUM! I have yet to break into anything pumpkin and I am dying to! Yum! I love pumpkin and butterscotch! I thought of you this morning as I was eating one of those Halloween donuts from Krispy Kreme. It would be so much better if it had a pumpkin creme filling! I am making these next week. They look marvelous. These look divine! I love cookies and pumpkin and pumpkin cookies. I want those cookies asap! Yum! I have to try these!! ASAP!